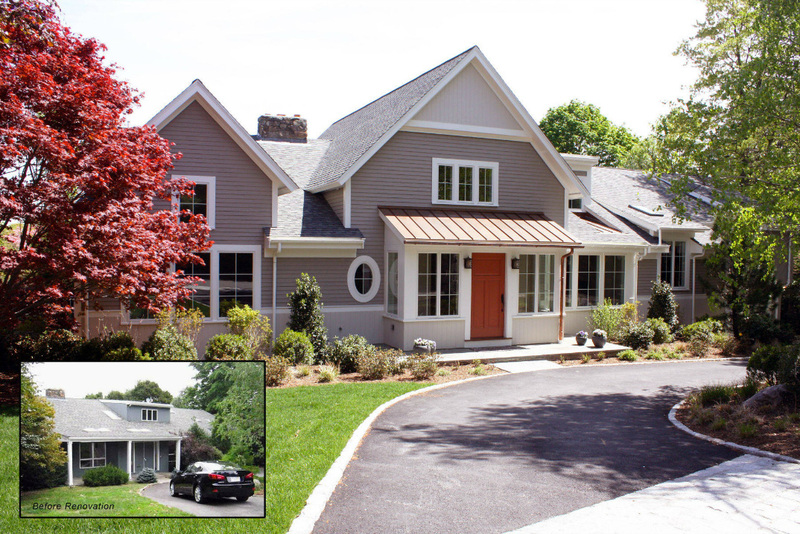 As architects and planners, SMOOK Architecture is often asked by their clients, friends and colleagues to assist upgrading the curb appeal of their homes. As any realtor will tell you, upgrading the appearance of your home is the single best investment to boost your home’s value. If your home is on the market, this may be the quickest way to transform that “For Sale” sign into “Sold”! Start with quick and easy updates. Consider upgrading your front door and garage doors by choosing a style that is appropriate for your home; perhaps carriage doors for your Colonial or sleek metal framed doors with frosted glass panels to reflect a contemporary flair. Repaint the exterior or re-side the building to create a dramatic change in your home’s appearance. When choosing a paint color, limit bold hues to accent areas. 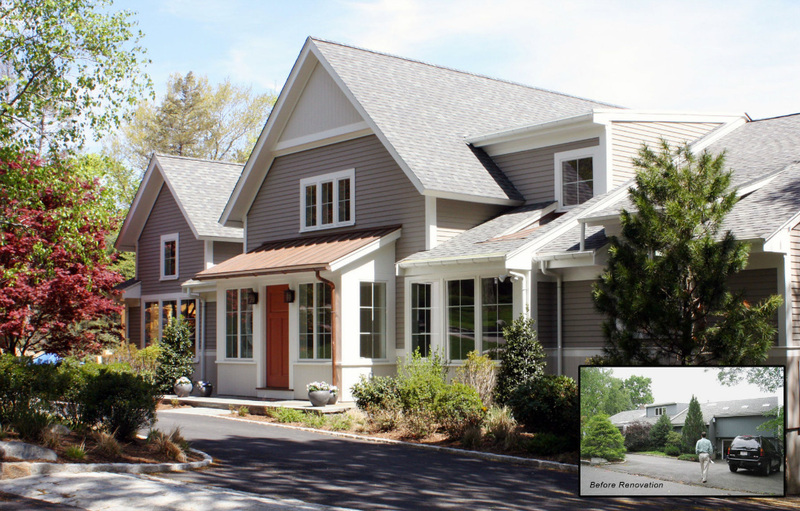 If you decide to re-side, there are many options including upgraded vinyl siding or cement boards (James Hardie being one popular brand) to replicate shingles, clapboard, paneling, and trim. Don’t fret if your home has a brick veneer on the outside. If you like it, keep it; if not, it can be painted or removed. Bonus: consult a professional about adding an extra layer of rigid insulation under the new exterior siding to increase the home’s insulation value. Research ‘Mass Save Home Energy Service Program’ for tax incentives and rebates to cut costs. Accessorize the exterior with new house numbers that specifically speak to the style of your home, shutters if they are appropriate or half-round galvanized gutters for a historic look. Thinking of building an addition on the back of your home? Think again. When properly sited and designed, an addition out front or a newly constructed second story can improve your curbside’s aesthetics and fulfill your space needs like that new home office; a perfect double play! Often a no man’s land between curb and building, the front yard can be most the important area for improvement. Hardscape and softscape designs can be the easiest upgrades - trimming overgrown shrubs, adding new fencing or a pergola to frame the entry to your home. Plantings provide an interesting soft counterpoint to the “bricks and sticks” of the structure. Expand the planting beds to minimize grass areas and replant with appropriate size plantings. Consult your local nursery to choose regionally correct plants that bloom during different seasons. Better yet, chose plantings that require minimal watering; a great selling point as most towns have water restrictions. Doing work without the help of a professional? Remember to call DIG SAFE; it’s the law. Even for the smallest projects, a trained professional can add value. Architects and Landscape Architects are trained to transform needs and desires into a reality. 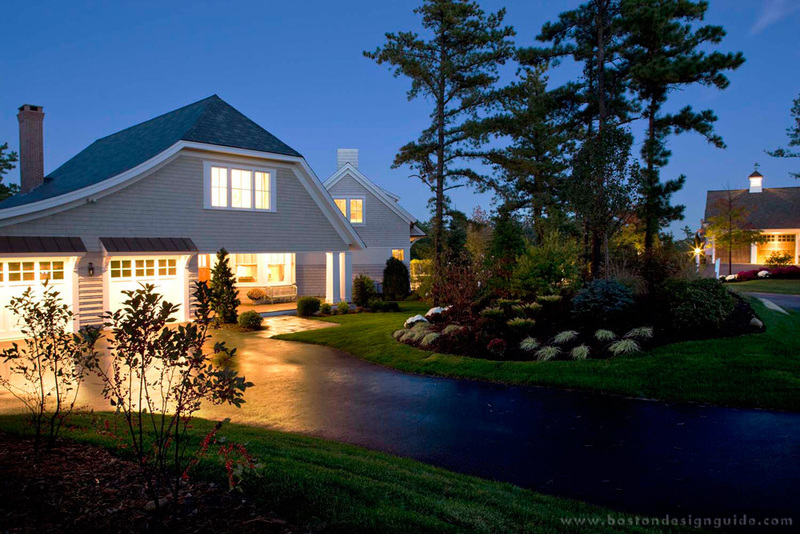 View Boston Design Guide’s list of Landscape Architects by clicking here.